State of Georgia Certificate of Authority to perform installations, maintenance and service of Class I, II and III Boilers. 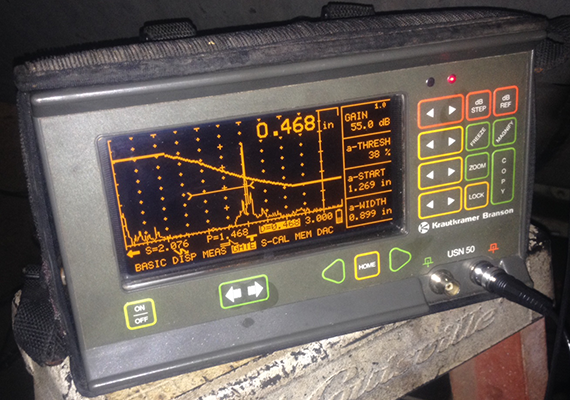 Ultrasonic testing (UT) - Mach II and Kraut Kramer Ultrasonic Flaw Detectors- Shear Wave and Straight Beam. Ultrasonic Thickness testing. Granit Blocks, Gage Blocks, Coatings thickness standards and other NIST traceable calibration standards in house. Duplex - Lean, Super and Super Duplex procedures have charpy impacts at -40 F and supplemental testing per ASTM A923 Method C under 10 mmd and Ferrite percentage per ASTM E562 meeting the 35% minimum to 60% maximum requirements.